I'm not sure how it is with you, but I often find with me that things have a tendency to flow from one project into the next, taking the influences and hints from the previous train of thought... especially with colors. I don't necessarily think that this is something that I intentionally do, but something that I notice only after the fact. Some time ago, I realized that I seem to work in color clusters, and that one inspiration color that I'm feeling at the time gets carried over. Following close on it's heels was my "purple phase"... this phase is technically ongoing starting with "Whirly Girl" (which I hope to release in spring) that influenced "Home Sweet Home", and lead me right into my "Lovebirds' Remix", which is currently a back burner project until I figure out the final direction it should go... oh, and I almost forgot my purple and orange HST quilt!?! 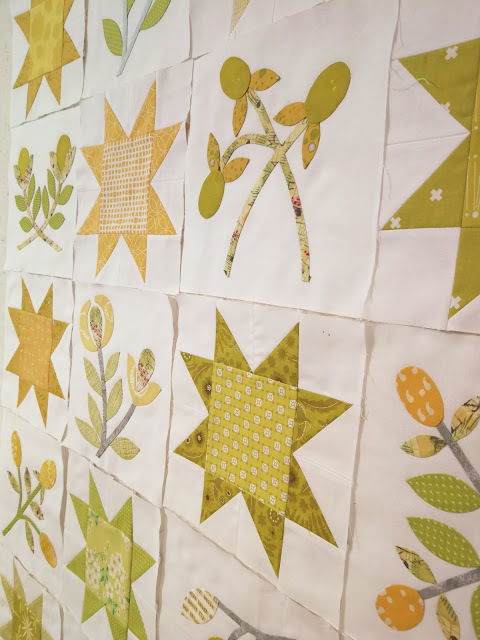 In an effort to be more controlled with my colors choices and prints, I noticed myself using a lot of Basic Grey grunge fabrics in my "grunge phase"... does "Lovebirds' Garden", "Home Sweet Home", "Apple Of My Eye", and "Contrasting" bring anything to mind? Often, people mention that they can identify my work because of the bright popping colors, but that kind of leaves my "toned down pastel phase" without explanation. 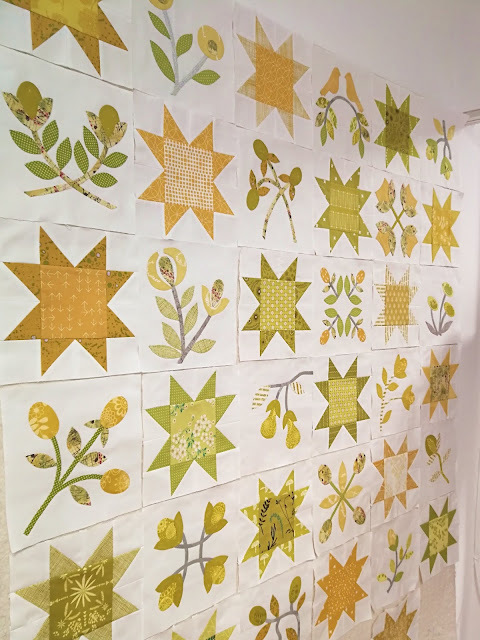 My "Home Sweet Home " quilt seems to be connected to several phases, but my "Summer Smoothie" bee quilt boasts a similar subtle, and subdued color palette. 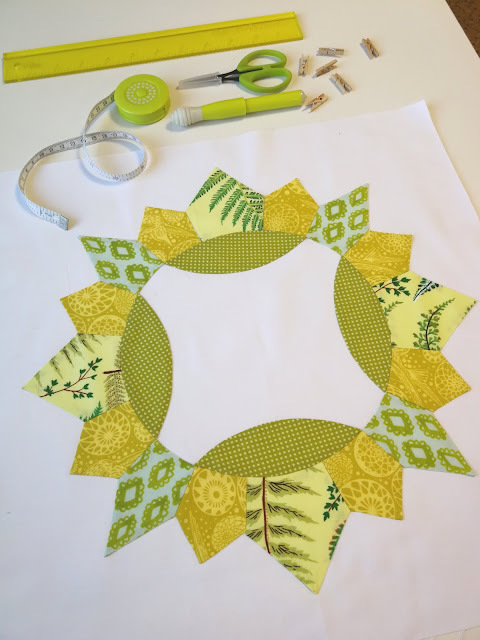 My current "Folk Flower" quilt definately fits in here too! 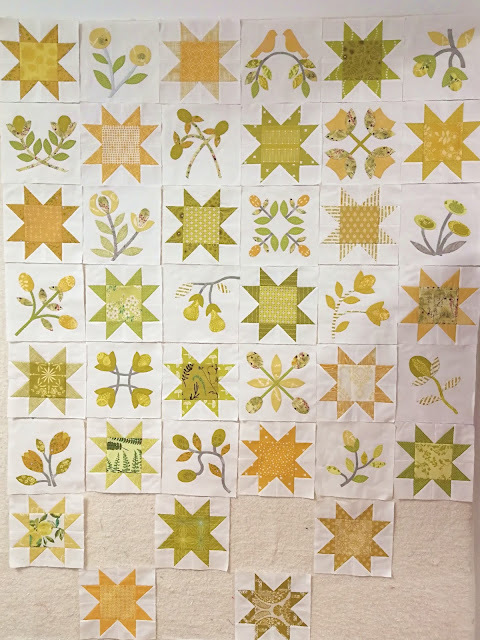 Let's not forget to mention my "earth tones phase" with my "Penny Sampler", the recently finished "Cascade" quilt top from Victoria Findlay Wolfe's book... and I won't include all the smaller projects that belong in this category. ... AND FINALLY, we make it to my current flavor of the month, the "green/yellow phase", which has the honor of my design wall status for December... perhaps it's sunny brightness is helping battle the dreary greys of winter. In any case, it's easy to see the connection between my latest "Yellow Stars" quilt and my "Brimfield blocks". 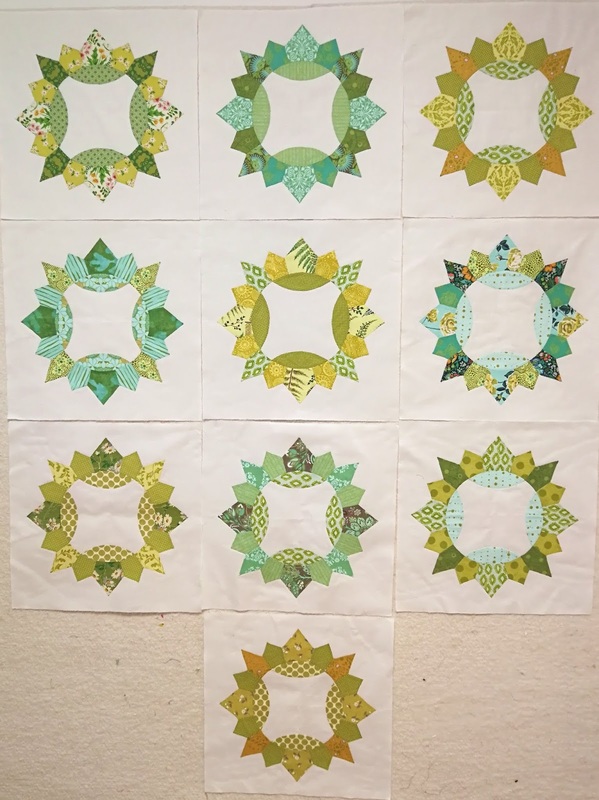 Just to be on the safe side, I'll through my "Chuck Nohara" project and "Green Smoothie" quilts into the mix. So, what's your current "color mood"... Do you go though phases and embrace a "color mood" that you carry from project to project, or do you work with a completely new color scheme with each new project? 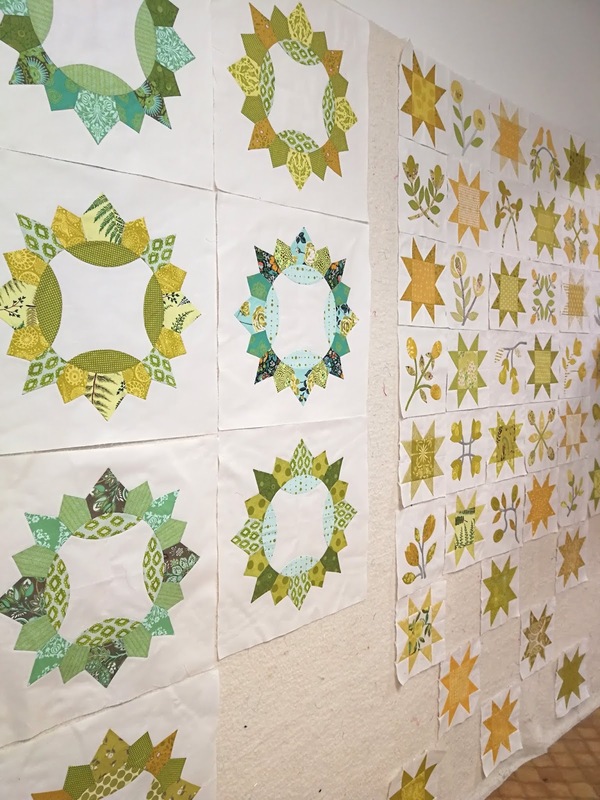 I have been through "color moods" for sure -- the first half dozen quilts I made were all some combination of pink, green, brown, and shades thereof. 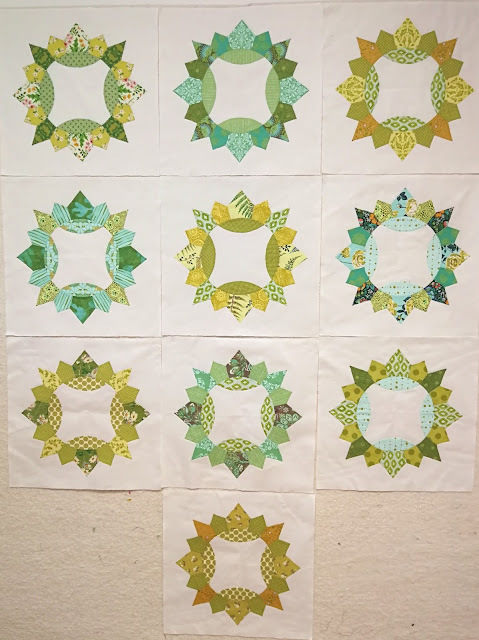 Lately I've been working with all different shades of blue, aqua, and green -- but that's mostly because I've been trying to cull those scrap piles and it hasn't been successful! I do go through phases. 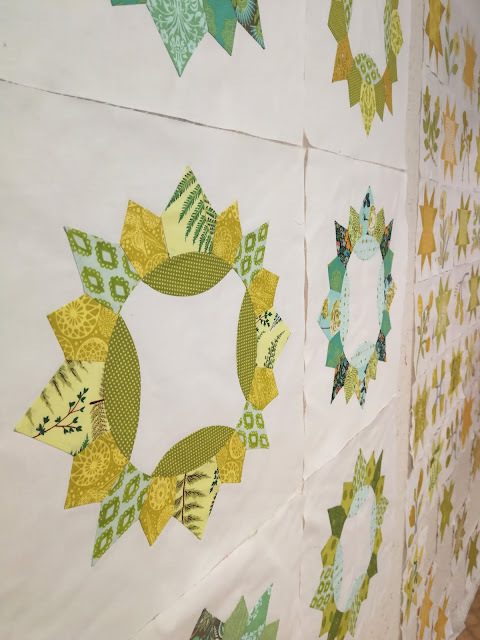 I've been in a dark phase, and my current quilt is maybe too dark. I'm looking forward to lightening things up with my next project, if I can! I am drawn to these soft colors in your quilt. 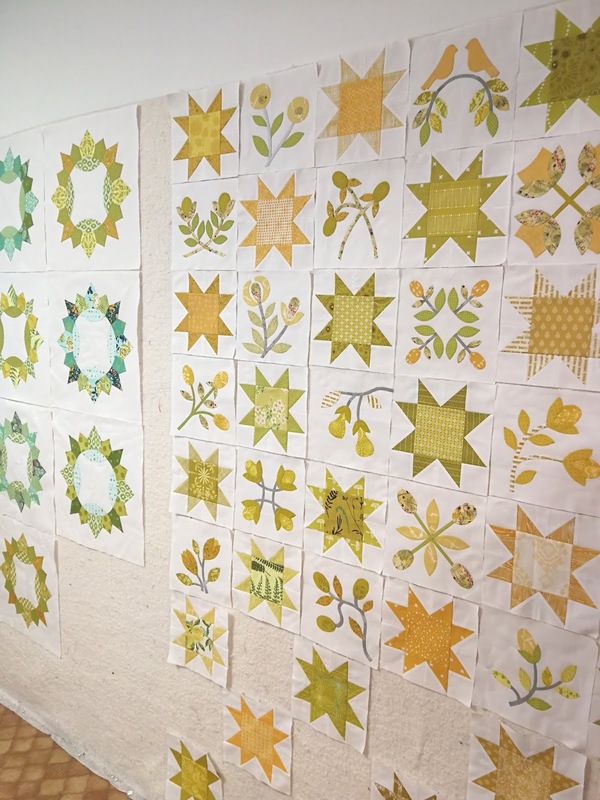 Usually I'm a muddy color kinda quilt girl, but I'm loving the soft green and mustard here. Beautiful blocks.